I'm almost 100% sure of the composition of this cover. The four kids framing the open wardrobe. I'm pretty sure the lamp post was centered. And I know there were fur coats and pine trees. This was not one of my favorite covers--in fact, I think it might be in the bottom two. I'm really looking forward to seeing the real image and how close (or far) I got to it. 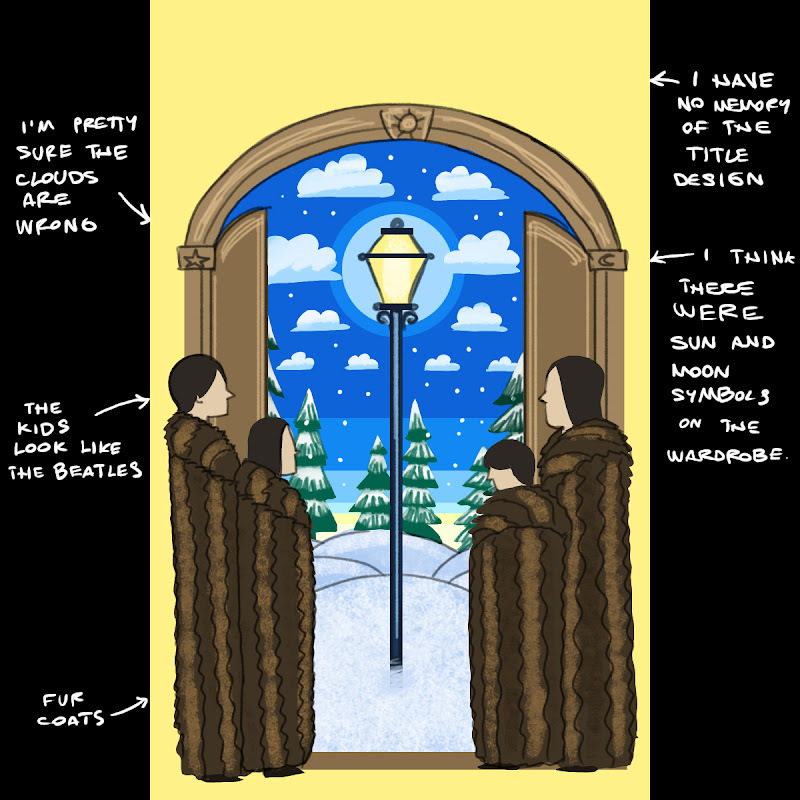 I remember every story element that appeared on the cover; the coats, the snowy landscape and the lamp post. I also firmly remember the Snow Queen (is that what she was called?) giving Edmund the Turkish Delight--which in my mind was something like teriyaki beef jerky, it never seemed like candy to me, definitely beef jerky. I also remember that Santa Claus/Father Christmas shows up(?) And I remember that the Snow Queen could freeze people into statues. How they beat the Snow Queen, or, really, anything besides the stuff above. Now, I saw the movie they made of this book, back when it came out. But I remember it even less than I do the book. I do remember that Tilda Swinton was the best part, and I remember thinking the kids in the movie made the wrong choice: when choosing sides between Tilda Swinton and a lumpy CGI lion, you should ALWAYS choose Tilda Swinton. So, I just googled and I'm pretty sure there are more separate covers for this book than for any other book I have ever seen (except maybe the Bible, but that's always the exception). I know which one you're aiming for, though, so good job. Whoops! Just realized I wasn't supposed to google until the very end. Shucks. Hey, I remember these covers. They were awesome. The current covers are pretty lame by comparison. It's okay, Q, feel free to google. I'm the one who's not allowed to look. I don't want to look until the end, because I'm sure I'll see other titles in the series by accident. You're right--they do look like Beatles! That cracks me up. I wasn't sure what covers you were talking about until I saw this--these are actually the covers I grew up with as well, and I still have some of the books with these covers on my bookshelf. This is the series I have on my bookshelf. I got them through book orders at school in 4th grade. It was like CHristmas morning when I carried them home. The covers are all coming back to me now. The easiest one for me to picture is the Silver Chair. Clint thinks Tilda Swinton is hot, also. I think men who read a lot of fantasy like the elfish look. I think I still have this boxed set somewhere (maybe at my mother's house? ), so if you can't track down the covers--and I didn't find them on the first 4 or 5 pages of a Google search--I can scan them for you at the end of things. Did anyone else get into C. S. Lewis by reading THE LION, THE WITCH etc in their Sunday School reader--it was serialized along witht the Bible in comics. Will, I am preempting your answer a bit here. I didn't realize cover art trivia made me all wound up and competitive, but I work at a book store and got google fever. Current cover artists that I've seen: Pauline Baynes'(who did the original drawings), David Wiesner, Chris Van Allsburg, and Cliff Nielson, whose overtly digital version seems to garner many "lame" comments. The cover artist for Nathan's psychedelic version is Roger Hane. Nathan, all this will be useful to you... ah, later. No peaking. I have this boxed set as well! Inherited from my brother Jason, actually. BTW, she's the White Witch. Also, in the '80's cartoon movie, the Turkish Delight looks like chocolates, and Edmund was all sticky when he was done, leading my family to salivate over Turkish Delight . . . which we later discovered is actually nasty dried apricots coated with nuts and powdered sugar. My whole childhood was destroyed. Sounds like there are a lot of fans of these old covers. I'm glad to hear so many of you had them. Ron, I've never heard of that. Serialized in a Sunday School reader? I had no idea. That's fascinating. I didn't catch on to the underlying Christian message as a kid. I thought it was all just dragons and talking animals. I'm not sure how I would have felt about it if it had been presented as a Sunday School lesson.